A firearm or a captive-bolt are both suitable methods for humanely killing adult cattle. The firearm should deliver at least the muzzle energy of a standard 0.22 magnum cartridge. For larger animals and bulls, 0.30 calibre high-power cartridges are recommended. For calves a rifle should deliver at least the muzzle energy of a standard 0.22 long rifle cartridge. Use of a captive bolt must deliver the correct charge and be followed by bleeding out to ensure death. Aim the firearm at the point of intersection of lines taken diagonally from the top of each ear to the inside corner of the opposite eye (position A). The poll method is not recommended for cattle. Only use the poll method if accessing the frontal position is not possible. The animal is shot from above (position B) mid-way between each ear with the direction of aim down towards the muzzle of the animal. 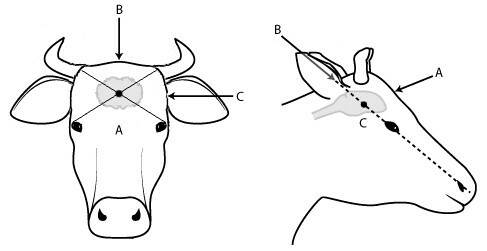 The animal is shot from the side so that the bullet enters the skull midway between the eye and the base of the ear on the same side of the head (position C). The bullet should be directed horizontally. The temporal position should only be used if frontal position is not possible. Note: Stunning (by captive bolt) does not necessarily result in death. Bleeding out must be carried out immediately to ensure death occurs. The use of blunt trauma on newborn young calves less than 24 hours old must immediately be followed by bleeding out, while the animal is unconscious, to ensure death. Read about humane killing of unwanted calves. Read about duty of care for animals. Read about animal welfare codes of practice. Read about animal welfare law.